Customers that wish to expand their systems can purchase components at competitive prices. 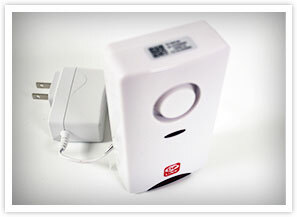 Oplink Security is taking a mainstream commercial approach to home security. Oplink’s approach has forced them to simplify installation, equipment use, and monitoring. The result: a super easy-to-use and -install system. 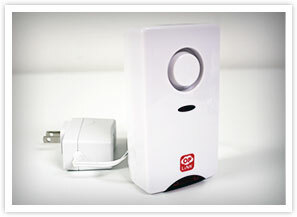 Oplink Security also simplifies the monthly payment and contract portion of home security. Unlike most home security companies, Oplink does not lock customers into long contractual agreements or charge cancellation fees. Oplink customers simply pay month-to-month and can cancel anytime with the appropriate notice. Oplink Security’s technology combines their proprietary cloud networking infrastructure with a wireless processing unit, security sensors/cameras, and a simple, easy to use mobile application that works on smartphones or tablets. The core of Oplink’s technology is the Oplink Cloud, which communicates with each component of the Oplink security system, enabling true plug and play installation, and providing constant communication with the entire system as well as the mobile app. Oplink Security is a new company with only 2-years under its belt. At this point, one can only speculate at their abilities to scale and service a larger pool of consumers. It’s important to remember when signing up with a new company that there may be speed bumps along the way. There isn’t a lot of history from this company to accurately display their capacity to serve customers. Oplink Security does not offer professionally monitored services. 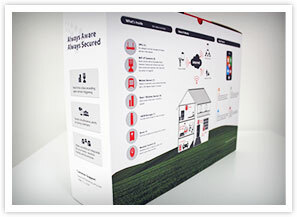 All packages are self-monitored and include access to their extremely convenient security cloud. Professionally monitored systems provide extra peace-of-mind to those concerning intrusion protection. 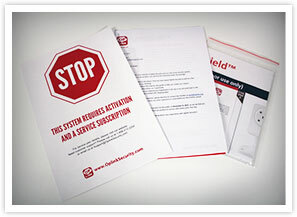 While Oplink Security can prevent intrusions, the system is better geared for theft prevention. Will Oplink be able to keep customers happy as they continue to expand? It’s hard to tell since the company is so young. How does it work without monitoring? Customers have to go through another company to truly keep their home under the watchful eye of a monitoring center. Will they expand their services? Oplink only services the west coast (CA) right now. 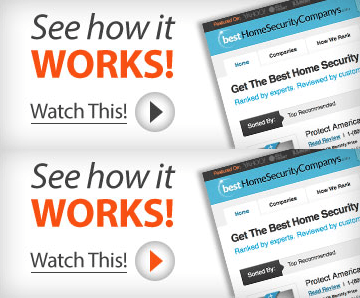 BestHomeSecurityCompanys.com was in no way paid or compensated to write this review. 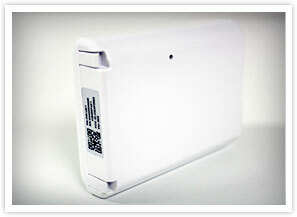 Our experts obtianed the Oplink Security system through their website and conducted an independent review of the system. To preface this review, all of Oplink’s systems are backed by a limited warranty that covers parts. No security system is perfect nor is its equipment perfect. Every home security system is susceptible to faulty sensors or other pieces of equipment but it does not mean the system is bad. 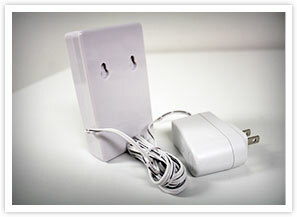 That said, Oplink Security uses its own proprietary equipment designed in the USA and manufactured in China. 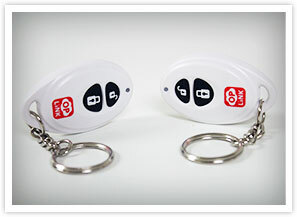 Oplink’s keychain FOB is made of durable plastic and metal. 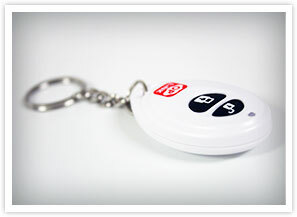 The key fob is a minimalist’s dream with only 2 buttons from which to choose. 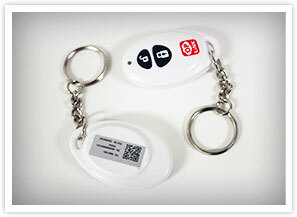 The key fob is roughly the size of most car key fobs in regards to shape and size. 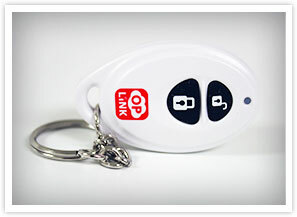 The Oplink key fob is lighter and smaller than most key fobs we’ve reveiwed which is a nice plus. The Oplink processing unit (OPU) is the brains of the security system. 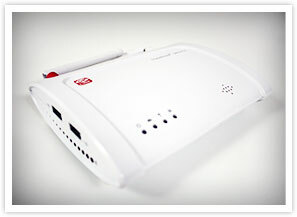 The hub provides wireless access to the Oplink cloud and automatically manages all Oplink devices in a home. 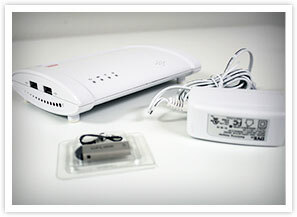 The OPU is the same size and style of most home wireless routers. It’s extremely easy-to-use and really does plug and play. The Oplink IP camera is a nice touch to the system. 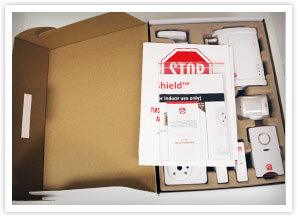 In fact, it may be the one thing that sets it apart from most home security systems. 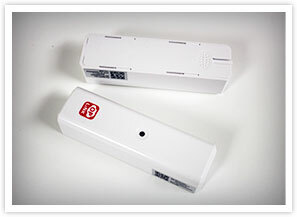 The IP cameras are easy to setup and work just like other IP cameras. 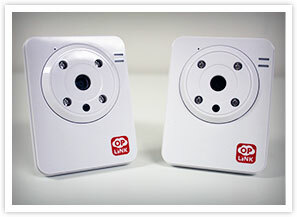 The Oplink IP cameras are not HD but provide good enough quality to see what’s going on in a home. The camera feeds can be shared via Videogram and streamed through the Oplink APP. 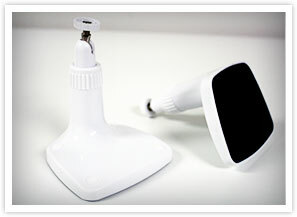 While the cameras could be higher quality, they are a great addition to the Oplink system. 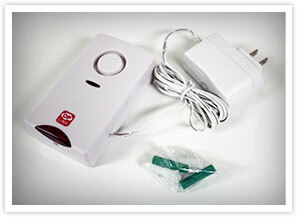 Oplink’s entry sensors adhere to doors and windows to help alert homeowners when they’re opened. 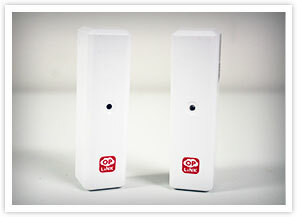 The Oplink sensor is quite long and awkward compared to other home security brands. 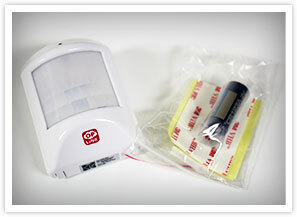 Like other Oplink equipment, the sensors are made of durable plastic. Installation is very simple depending on the doorframe and window frame. 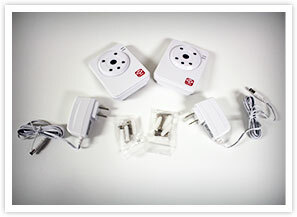 Homeowners can choose to adhere the sensors with the provided 3M strips or screw them in. Overall the entry sensors are good but not great. 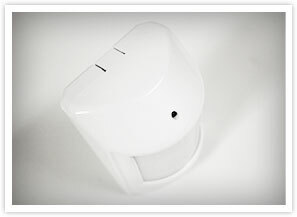 The Oplink motion sensor uses passive infrared (PIR) technology. 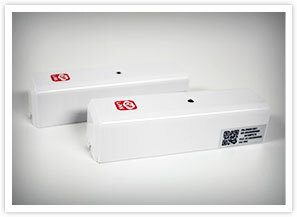 PIR sensors are the most widely used motion in home security systems. 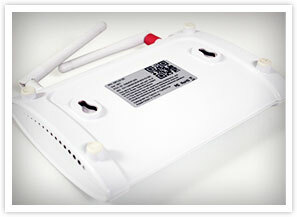 Once the sensor warms up, it can detect heat and movement in the surrounding areas. Homeowners are advised, when installing their motion sensors to, “Avoid placing near hot lamps, heaters, air conditioners, or near heavy-electronics like refrigerators, microwaves, and wireless routers.“ PIR sensors are clearly limited as to where they can be placed within a home. 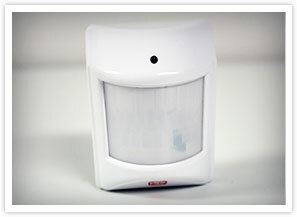 The Oplink motion sensor is made of durable plastic and comes with adhesive strips for self-installation. 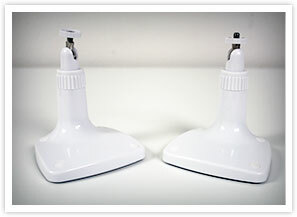 Our experts have no complaints with its functionality other than its sensitivity and limited placement capabilities. This product and customer service is horrible. They cameras keep going out throughout the day and especially at night. 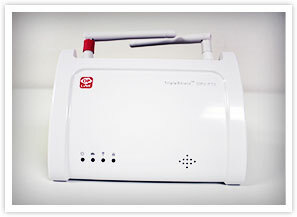 I used it to monitor my 91 yr old mom and this product is completely unreliable ….do not buy. Customer service is only available during business bankers hours….. Ordered this on Groupon and waited longer than the fourteen day return policy to try to get someone to set it up for me. Unfortunately after three hours of my daughter trying to set this up and trying to call you with no response we gave up. After she left I had the opportunity to live chat with Charles who was absolutely no help. As a result I’m stuck with a product that I can’t get to work and a lighter wallet. Thanks for nothing. Hopefully Groupon will come through for me and make and exception to their policy. I would not recommend this for anyone technology challenged. I have there system and I love it, there customer service is helpful and polite. I had my sensitivity to high on the cameras. The alarm was going off every time I put it on armed. The only thing is its hard to find outside cameras, to add to it. I purchased my system(on HSN) so I called OplinkSecutity’s customer support and a recording came on, so I hung up. To my surprise a rep. Kenneth Bradley called me back soon after and assisted me with installation, and was very informative about other products available and willing to assist me with my system. I was surprised that he did not try to sell me the premium service but said I could get it for a few days when I go on vacation then I could cancel it. Well I am impressed with Oplink Security system. I’m glad their Premium service is available with no obligations as I will subsribe to it in the future.. I got the OpLink system for a different purpose than most. I was less worried about somebody coming in than I was about somebody wandering out, especially in the middle of the night — think Alzheimers and rebellious teens. 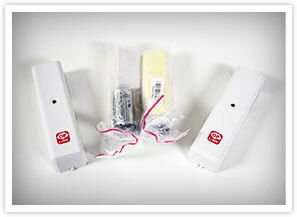 For my home, I got 3 door alarms, 1 motion detector and 1 camera. Of course, along with that came their alarm and the heart of the system, the OPU. The instructions were good and I was able to quickly and easily get the OPU talking to my router and then get all the accessories talking to the OPU. I had the whole system installing and up and running in less than 30 minutes. Then, I began to play with it. My only complaint is that the motion detector didn’t come with any info on the angle of motion captured, so, I didn’t know if it got 90 degrees, 160 degrees or more. In my case it didn’t matter too much because I positioned it to monitor two closely located exits. That way, I can get an alert if anyone goes into that room when the alarm is fully set. Oh, and it gives me a couple of different settings for arming it. In the full mode, the motion detectors are going as are all the door alarms (and the camera can be used as a motion detector too). In the Stay Mode, only the door alarms are armed. That means I can wander around the areas of the camera and motion detector without setting them off. The alarm is plenty loud (since I put it in our bedroom), a secondary alarm would be nice (so I could put it elsewhere). But THE GREATEST feature is the ability to control it all from my iphone. I can arm or disarm the whole system from anywhere I can get phone reception. I also get notifications on my phone and email. So, if I need to run out for a minute or ten and need to make sure no one wanders out, I can arm the alarm in Stay Mode and know if anyone opens a door. I am not worried about hooking it up with the Police Department (I don’t want their charges). If the alarm goes off, I just look at the camera view from my cell phone (it snaps a shot each time the alarm goes off) and see what happened and then what it currently going on. I can then decide if I need to rush home, call a neighbor, or the cops. Personally, I think the system is a great value. This system is a massive load of value for the price paid. When I was looking for a security system, I had no idea what I was looking for or what I really needed. I came across this Oplink System and was a little hesitant to make the purchase. After looking at a couple review sites, the reviews were fairly positive. So I decided to go for it and I’m glad I did. It was very easy to install. Took me less than 30 minutes. It comes with a easy app, you install on your Smartphone. This app is where you have most control over the system. Which works very well since I have my Smartphone glued to me at all times. I get alerts when the alarm is set off and a snapshot of what set it off . What I love the most is I can be at work and look in on my family. Overall, I am a happy customer and were actually looking in to buying my mom one. A couple of months ago we learned through our neighbors that they had several items(high end stroller & kids bikes) stolen right off their front porches. The neighbors called the police and reported the theft, but there isn’t much they can do because no one had seen anything or anyone. This was a very scary situation as there are a number of children under the age of 5 in the neighboring houses, and I decided that we needed to figure out a way to keep a closer eye on our shared driveway area. I thought about Comcast & ADT but didn’t want to spend the big money on them or wait a few weeks for them to come and install something, and I really didn’t want to deal with another long term contract . So a friend told me about the Oplink products. 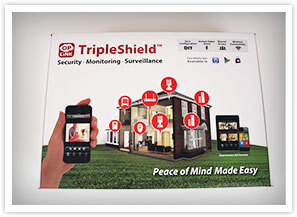 I picked up their TripleSheild product which turned out to be very affordable and perfect for my needs. I was also incredibly impressed with how easy it was to setup and use. I mean, in less than 30 minutes, I had the surveillance cameras setup and working, as well as the alarm hooked up. Which I put outside the house, and I am not technical at ALL! The system is also easily scale-able so I can add more cameras and sensors as I see fit. The really cool thing is that I can now watch my driveway area, day or night, where ever I am with the Android app on my smart phone. The system also has the ability to record the video for an extensive period of time. This way, when the thieves come back to steal more stuff, I’ll have a recording to show the police. This is the piece of mind I’ve been looking for!!! After a good Sunday afternoons worth of research into this subject we narrowed our choices down to the Comcast (Xfinity) based system, AT&T’s Digital Life system, a full-on commercial grade Arecont Vision megapixel IP camera system or a pair of inexpensive, self install systems from either OP Link or 2GIG Technologies. Our conclusions were essentially this. Comcast/xfinity, could not get ANY useful information from friendly Comcast rep. Limited a la carte` equipment choices, plus we don’t need the remote access & control for HVAC, lighting, doors locks, etc. & most critical, we have to deal with Comcast. AT&T Digital Life, sadly after three years and miles of fiber in the ground, still no service in our neighborhood. Way to keep up with technology AT&T. Arecont Vision, has cameras so good you can read an iPhone screen from their remote viewer. If I had a business I would use them without question but for the money they are priced out of the residential/consumer market & they do not offer any remote sensors. If 2GIG would have been a bit more generous with their camera pricing ($165 EACH on top of a $350 system!) would have gone with them, so it was Oplink. Not much in the way of reviews but being fairly technical (& a C-7) I could read through most of the marketing hype & see that they had a fairly robust wireless hub, good quality wireless cameras & remote viewing app., enough remote sensors for a typical 3bd, 2 ba house & a comparable monthly monitoring fee. The installation did take a few hours but was mostly due to our trying different camera locations and then trying our best to disguise their location and bring the A/C to them. The door/window sensors took 10 minutes each to install and the whole system was able to auto detect all the components and install the viewer on our smartphones without a hiccup. We’ve had a pair of false alarms (that were due to our Comcast router going down) but since then the whole system has been fairly rock solid, easy to use & monitor, qualified us for a 10% home owners insurance discount & does what an alarm system should do, give you a little peace of mind. I’m loving my Oplink Security system for a few reasons. First, it’s so much more affordable for what you get. I can’t remember exactly what the other (old-school) alarm company wanted to charge me but it was easily 5X as much. With oplink I got to install the system myself and didn’t have to worry about scheduling an installation crew to come to my house. I’m fairly particular about my home so it was nice to be able to put the sensors where I wanted them to go rather than having to micro-manage an installer. And, the fact that the system sends me the 30-second video alerts is really sweet. The quality of the footage looks great both by day and by night (infrared) and i get to decide if taking action is necessary. Just looking at the live cams on my Oplink app is reassuring and I find myself opening the app throughout the day to look at the live cams just for fun. This system is great for my needs and the quality of both the hardware and software is top notch. And, the fact that it’s so crazy-affordable is really the cherry on top. Oplink gets a big thumbs up from me.